I have been gushing over the girls thus far this awards season. But I realize I have yet to show the men of film and television the love they deserve. Men’s red carpet fashions may not be as intricate or extravagant as the women’s, which I guess isn’t as exciting. But that’s fine with me. Call it my love for Classic Hollywood coming into the foreplay, but I appreciate the simplicity of a man in black and white. Keeping it classic is the appeal. Otherwise you just look like a ridiculous clown in oversized bows, gaudy suedes, and clashing prints (the Grammy’s aren’t here just yet). 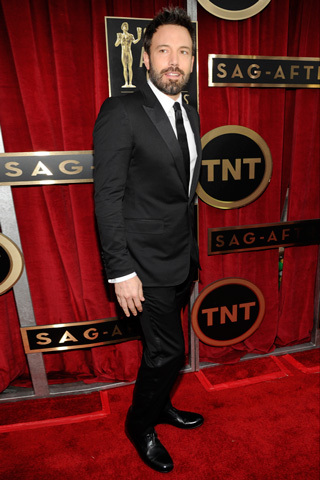 Bradley Cooper in Tom Ford. John Krasinkski in Calvin Klein Collection. Eddie Redmayne in BOSS Black. Mr. On His Suit and Tie Sh*t himself, breaking his own rules, JT in Tom Ford.